Thread cleaned up! 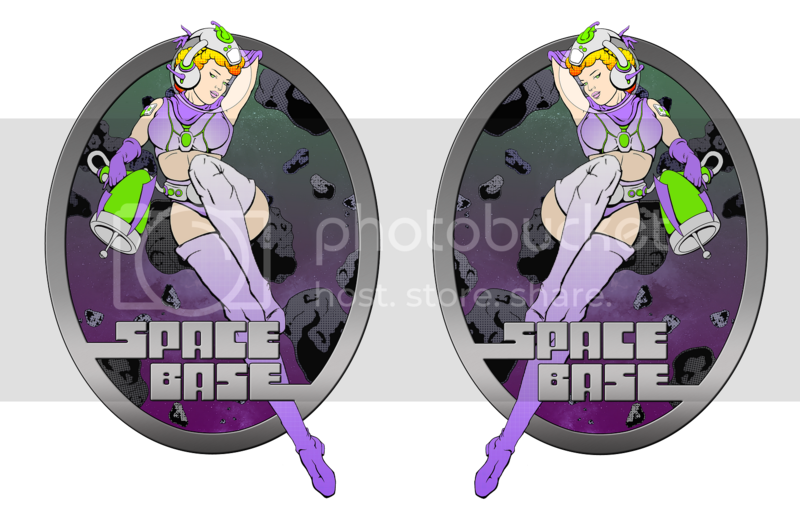 Looks awesome, I like the retro-cheesecake space-babe theme. I had to look this game up. I want to say I remember the the cleaner goat version of this game from my youth but I can't say for sure. I would of been in grade-school when this game was out in the wild & honestly would of probably ignored it at Alladins castle or Chuckie Cheese. But, I dig the artwork. Reminds me of the classic sci-fi comics. Same here. I would've skipped it in the wild. But as I got older and pretty much played the crap out of the usual favs you start looking for different style of games. Here's a little audio teaser I slapped together. Edited this post to share a link to the mp3 version. 2.25 mb, enjoy. Here's a little audio teaser I slapped together. Beware, this is 16.5 whole megabytes. Totally worth a listen in my incredibly biased opinion. This is like an ear candy snapshot of where we are headed. Restoring my 8th arcade machine, Mortal Kombat 2! That is pretty awesome man! You know someone is a perfectionist about their work when they won't compress a song less than 2 mins long below 16 MB. That's a good thing, though. This is teaser pretty damn sweet. Obviously professional work. So by teaser, do you mean that this will be used in attract mode, or is this more like promotional music? This actually wasn't meant fo forum posting, but one of the other guys suggested I post it. Ill crush it down to soulless mp3 soon. **edit here you go, 2.25mb. Hmm... How about a horizontal brushed steel/aluminium on the plane faces (text + circles), instead of the silver fading? now I'll just be happy to get a complete parts list, art download, cut plans, and program/music downloads out into the community so anybody can make their own. This is an amazing project and it's great that you are sharing the artwork, sounds and music. 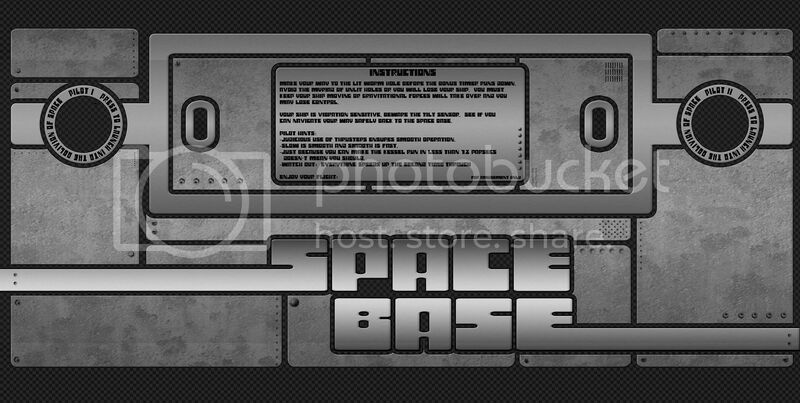 I've started on my own version of SpaceBase, but instead of building a cabinet, I'm doing an arcade version that can be played on any cabinet (with two joysticks). Super coolness. This may be the first "indie" thing I install on my cab if possible. This project has be stoked. 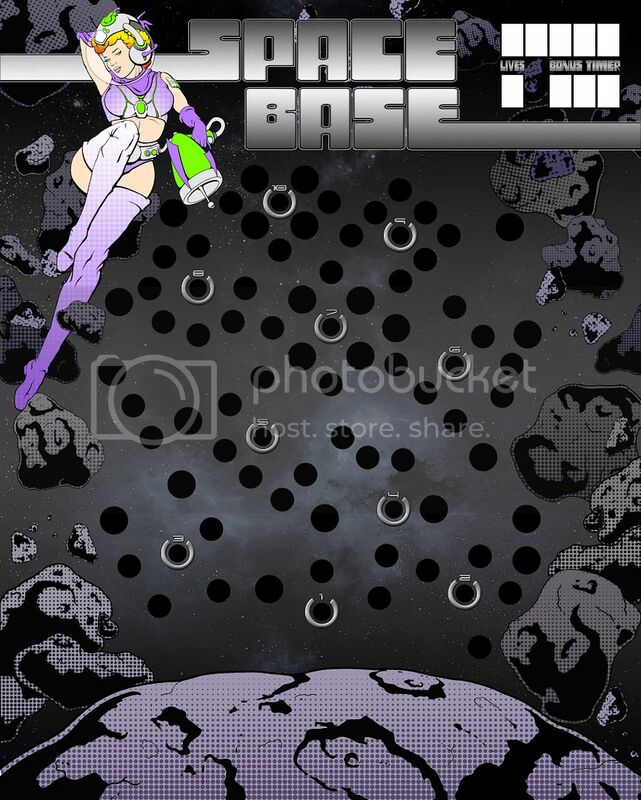 Spent a fair amount of time doing the initial cut plan for the playfield, now I'll tackle the two different cabs that this will require (one that is packable so I can get it up to Canada for IDS to work with) and one that is a straight ICB clone for me The image shows the playfield with the CNC cut path overlaid. Should get access to the CNC next month so I'll be getting everything ready to be cut between now and then. Feeling pretty good about this! The upload images don't show but those surfaces are brushed; however, since you mentioned it I'll take a look at the brush to fade ratio on those and see if I can't clean it up some more. The brush is pretty fine and done at 45o but I'll adjust the angle, length, and see if there's something more better lurking in there. Thanks for the feedback! Awesome, we used the flash version quite a bit in developing our initial rule set and to get a feel for the game since none of us actually own an ICB or Zeke's Peak. The rule set we're designing is a fair departure from original with regard to how the count down timer and difficulty adjusts. I think it's totally awesome you're tackling this. Once we get a the actual unit up and running it should be pretty easy to make your version spot on. CNC machine has arrived and is installed. System is one stepper motor coupling away from being functional, we busted one when a factor installed set screw backed out and caught the mount during testing. Tested everything else out that we could last night. Once that's replaced we'll be up and running, will need to confirm alignment and start cutting. Super excited, it's a 4ft x 4ft table. Hopefully we're making sawdust before too long! Having good friends who like to share their toys is awesome! CNC machine has arrived and is installed. I have to join the group that doesn't recall ever seeing one of these in the wild when I was younger, perhaps I just overlooked it for something with a monitor. This is looking great so far and I love the asteroid dodging theme you have added to it. The pinup style artwork is great as well. I have been hoping somebody would recreate the original ICB/Zeke's Peak!! Man, I am soooo all over this! You either made a stunning ICB panel, or the world's fugliest 4-player hit box cp. Looks great man! Can't wait to see IDS do his thing. Can someone please explain this term to me! Curiuous, ids where in Canada are you located? I'm jealous of the time you guys have to put into this, and the access to the tools that your friends have. Is your buddies sign shop going to double in flatpack copies of this for a single run? Given that I've had no free time for a few months, perhaps a smidgen of help would...well...help. Dang, I'm on the west coast in Vancouver.... too bad. Whoop another vancity person. I grew up there but need property and space to make my noise, so I moved to Nanaimo. I'm over there 2/3 times a month though. I hear ya.... I'm actually in Surrey, not Van itself...so I have a bit of room. Really looking forward to seeing this build finished! Surrey? Have you read Patton Oswalt's book and the chapter about the 10 days he spent in Surrey? I'm not sure what should surprise me more. That Patton Oswalt is capable of writing a book or that his fans are literate. If you watch or listen to his stand up comedy, you realize that he is actually pretty damn funny and not at all unsmart.. I was surprised myself, and now I am a fan..
Been having some rough times lately, but thought id offer a little more advice before its regrettable. The bar hinge mounts you have are not as robust as the originals.. and I suspect they wont hold up too well for duration of use. See if you can get someone to send closeups of the mounts. Even the originals had their weak points. I had to rebuild my assembly. I was fortunate to find a hobby shop that sold the thin walled tubing that matched the original spec. I drilled the holes, and then injected some hot glued into the tubes ends to keep them still so they wouldnt bend/flex/loosen. .. and while hot, inserted the mounts in place. The tube thickness is important. Too.thick... and there will be a drop off and or hop point... where one bar meets the next. You cant have a sticky spot on a game like this.. as it will throw off the much needed, and quite critical, gameplay control. I ended up using brass, cause I thought it looked great... and was a better match for the look of a bar themed game. However, after considering it more after the fact... I was thinking that the original tube may have better durability and less friction, with long term use. I think I at least clear coat sprayed them lightly after polishing them. I wondering if a 3 tube / bar system wouldnt be a better idea. A system to lock the main bar in center would be needed. As for the surface and hole internals... you want these glass smooth. Any surface friction will ruin gameplay.. as the ball may get slowed or stuck. Dust often was the cause... and it was so badly effecting gameplay, that I had to take the entire machine apart, cleaning every surface... including the ball routing trails. Probably want to use a laminate, and or a plexi covering. The holes will probably need plastic tube inserts... else the ball will wear them quite quickly... especially if using mdf. Plastic will also be easier to clean. Dont merely rely on paint. Balls rolling over a painted and.or even a lightly clearcoated surface... will still tear it apart quickly. On pinballs, the longest lasting machines playfields have a clear mylar film glued on them. Remember... mechanics are brutal. Friction, wear, mass, collisions... all a factor. Enough smahing... and things get loose. Loose parts cause misalignment. .. which causes grinding wear... which escalates quickly into permanent functionality problems. Great job, did you only do this panel or have you cnc'ed other stuff? I'm guessing it's all bad. Surrey is one of those places that has a really bad rep and once deserved it. There are still some rough pockets but it's much better than it was even 10 years ago. There are still some rough pockets but it's much better than it was even 10 years ago. Legalized abortion and the elimination of leaded gasoline are to thank for that. X, Assuming a system to keep a center bar in place, a three bar might not still work right. During gameplay what is the longest tangent between stops on the bar? If you tilt the bar enough, the playable field shrinks. That could be enough to influence the gameplay when a player can use the stop as a means to move the ball. Of course that can be done on the older two bar but the distance between each point expands keeping the posts in more or less same position relative to the playfield. A three bar with sliding stops perhaps? Yeah, it was. He basically said the only way he'd ever return to Surrey is if he had to go there to save the world from a mythical demon, and even at that, he might just say "screw it" and let the demon win. I think the issue with Surrey wasn't so much the town as it was the experience he had with the comedy club owner there. It's a good chapter called "The Victory Tour" in his book.